The day after returning from Iquitos, Peru I wrote in my gratitude journal what I was thankful for. Thankful for clean air to breathe, clean water to drink, fresh fruits and vegetables to eat, a roof over my head, and my children to hug. My list that day looked much different from my list a week prior. My gratitude entry prior to my mission looked like this: thankful for my family, friends, and a good job. 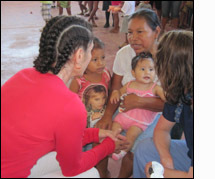 I left on my third medical mission with Hearts In Motion to an underserved area in Iquitos, Peru. I wanted to provide medical care to a population that could only be reached by plane or boat. This trip opened my eyes to the Peruvian people living in the Amazon flood plane for at least 3 months out of every year. Their houses were partially submerged by the swollen rivers; thus they were living in contaminated water. These people were constantly exposed to the elements in this water as this river is their water source for cooking, bathing, laundry, sewer, and their children's playground. There is no plumbing. One of their main sources of income is selling a tropical fruit juice on the street. They soak the tropical fruit in contaminated water for 24 hours and then make the juice sold by street vendors to the Peruvian people who ultimately get gastritis or parasites and many other health issues by consuming it. It is a viscous circle that cannot be broken. We saw 1,500 patients over 5 days. I served with other health care providers whom had the same feeling of giving back as I did. It is this connectedness that we all search for and something we can only hope to experience. I went thinking that we could help someone and I left knowing that we actually did!